The rules of chess (also known as the laws of chess) are rules governing the play of the game of chess. While the exact origins of chess are unclear, modern rules first took form during the Middle Ages. The rules continued to be slightly modified until the early 19th century, when they reached essentially their current form. The rules also varied somewhat from place to place. Today Fédération Internationale des Échecs (FIDE), also known as the World Chess Organization, sets the standard rules, with slight modifications made by some national organizations for their own purposes. There are variations of the rules for fast chess, correspondence chess, online chess, and chess variants. if they believe they will lose. In addition, there are several ways that a game can end in a draw. physically challenged players, the recording of moves using chess notation, as well as provide procedures for resolving irregularities which can occur during a game. Chess is played on a chessboard, a square board divided into 64 squares (eight-by-eight) of alternating color, which is similar to that used in draughts (checkers) (FIDE 2008). No matter what the actual colors of the board, the lighter-colored squares are called "light" or "white", and the darker-colored squares are called "dark" or "black". Sixteen "white" and sixteen "black" pieces are placed on the board at the beginning of the game. The board is placed so that a white square is in each player's near-right corner. Each player controls sixteen pieces. on right". The latter refers to setting up the board so that the square closest to each player's right is white. The player controlling the white army is named "White"; the player controlling the black pieces is named "Black". White moves first, then players alternate moves. Making a move is required; it is not legal to skip a move, even when having to move is detrimental. Play continues until a king is checkmated, a player resigns, or a draw is declared, as explained below. In addition, if the game is being played under a time control players who exceed their time limit lose the game. Swiss system tournament or Round-robin tournament) or, in the case of non-competitive play, mutual agreement, in which case some kind of random choice is often employed. Each chess piece has its own method of movement. Moves are made to vacant squares except when capturing an opponent's piece. can be put in check but cannot be captured (see below). The king can move exactly one square horizontally, vertically, or diagonally. Only once per player, per game, is a king allowed to make a special move known as castling (see below). The bishop moves any number of vacant squares in any diagonal direction. 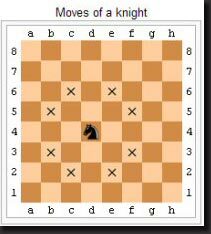 The knight moves to the nearest square not on the same rank, file, or giagonal. In other words, the knight moves two squares horizontally then one square vertically, or one square horizontally then two squares vertically. Its move is not blocked by other pieces: it jumps to the new location. A pawn can move forward one square, if that square is unoccupied. If it has not yet moved, each pawn has the option of moving two squares forward provided both squares in front of the pawn are unoccupied. A pawn cannot move backwards. Pawns are the only pieces that capture differently from how they move. They can capture an enemy piece on either of the two spaces adjacent to the space in front of them (i.e., the two squares diagonally in front of them) but cannot move to these spaces if they are vacant. The pawn is also involved in the two special moves en passant and promotion. The king and the rook must be on the same rank (Schiller 2003:19). If a pawn advances to its eighth rank, it is then promoted (converted) to a queen, rook, bishop, or knight of the same color, the choice being at the discretion of its player (a queen is usually chosen). The choice is not limited to previously captured pieces. Hence it is theoretically possible for a player to have up to nine queens or up to ten rooks, bishops, or knights if all of their pawns are promoted. If the desired piece is not available, the player should call the arbiter to provide the piece. Move the king to a square where it is not threatened. Capture the threatening piece (possibly with the king). Block the check by placing a piece between the king and the opponent's threatening piece. If it is not possible to get out of check, the king is checkmated and the game is over ). In informal games, it is customary to announce "check" when making a move that puts the opponent's king in check. However, in formal competitions check is rarely announced. If a player's king is placed in check and there is no legal move that player can make to escape check, then the king is said to be checkmated, the game ends, and that player loses. Unlike other pieces, the king is never actually captured or removed from the board because checkmate ends the game. The diagram shows a typical checkmate position. The white king is threatened by the black queen; every square to which the king could move is also threatened; it cannot capture the queen, because it would then be threatened by the rook.